Dozens of protesters across the country were fired from their jobs after skipping work to take part in last week's "Day Without Immigrants" demonstration. Restaurants and day cares were among the businesses in states like Florida, Tennessee, Oklahoma and New York where bosses fired workers after they didn't show up for work in order to protest. The company's attorney, Robert Peal, said in a statement obtained by the news station that all employees were told they risked termination if they skipped work on Thursday, but 18 did so anyway. The attorney wrote: "Regretfully, and consistent with its prior communication to all its employees, BCI had no choice but to terminate these individuals. The reason these employees missed work — to engage in peaceful demonstrations — had nothing to do with BCI's decision to terminate them." That same day in Florida, several staff members at Grace Community School in Bonita Springs told NBC2 they planned participate in Thursday's protest. Two employees claimed they were fired as a result, though the head of the school insists no one was terminated. Asked by a reporter why the cause was important, Brenda Botello, who quit on Friday because she was afraid of being fired, said: "Because we are Mexicans... We need to find another job." Telemundo 47 initially reported that at Ben's Kosher Delicatessen Restaurant & Caterers in Long Island, New York, 25 workers were fired Friday when they returned to work. The restaurant disputed the report, saying in a statement, "In anticipation of 'A Day Without Immigrants,' Ben’s Kosher Delicatessen Restaurant & Caterers, posted a formal statement to its Greenvale employees on Wednesday, February 15, expressing support for their human rights and requesting that they fill their shift as scheduled on Thursday, February 16." The statement continued, "While some employees opted to participate in the walkout, several others chose to work and, as a result, the leaders of the protest put pressure on the others to walk out, even threatening physical harm to colleagues choosing to work their shifts." As a result, the company owner "found this to be a cause for immediate dismissal of the employees who made the threats. All other employees involved with the walkout were, and still are, invited to return to their positions with the company." Some social media users are calling on others to boycott the small businesses and restaurants that fired immigrant workers. Local news outlets also reported that 21 employees were fired at a boat manufacturing company in South Carolina, 12 workers at an Oklahoma restaurant and 30 masonry workers in Denver. The Oklahoma restaurant I Don't Care Bar and Grill has already published a job posting looking to replace the fired cooks, NBC12 reported. 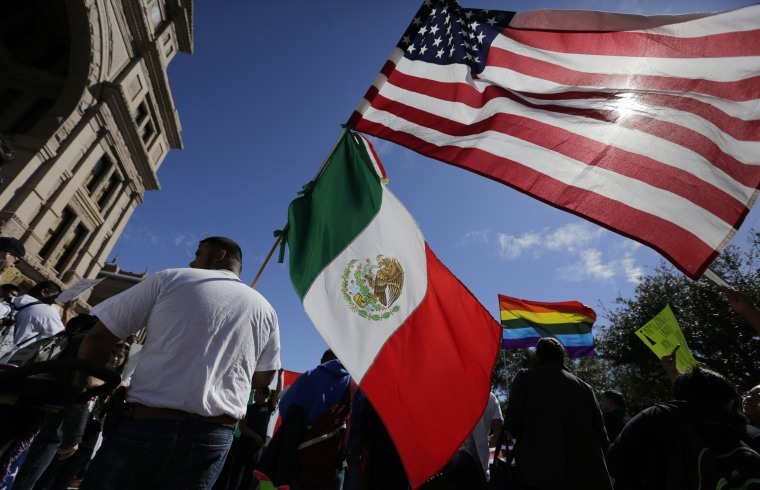 Last week's nationwide "Day Without Immigrants" protests were aimed at showcasing the impact immigrants have on the U.S. economy. Pro-immigrant protests continued throughout the weekend, with a Free the People Immigration March in Los Angeles on Friday and President's Day Weekend March and Rally in support of immigrants and refugees in Dallas on Friday. Editor's note: This story has been updated with response from Ben's Kosher Delicatessen Restaurant & Caterers.